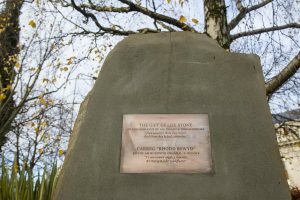 Kidney Wales marked the ten-year anniversary of the Gift of Life Stone, the first in the UK, with a re-dedication ceremony today to remember those who have donated organs in order to save the lives of others. On the eve of the second anniversary of the implementation of the Human Transplantation (Wales) Act 2013 that introduced deemed consent for organ donation to Wales, the families and friends of organ donors gathered in Alexandra Gardens in Cardiff City Centre to give thanks and reflect on the progress made in Wales in the past ten years since the stone was originally laid. The Organ Transplant Waiting List in Wales saw a 20% increase in people enduring the wait for a suitable organ – up from 192 to 243 people from 2015/16 to 2016/17. As at 31st March 2017, 170 of those individuals were waiting for kidneys (1). Attendees heard heartfelt and moving speeches made by the rarely heard voices of donor families, along with Prof Roy Thomas, Jane Hutt AM and TV presenter Llinos Lee, who all paid tribute to the individuals and families who have taken the decision to donate organs to give the gift of life to others. Colin and Betty Burgess, from Barry, lost their daughter Louise 15 years ago, very suddenly at the age of 33. Louise had often discussed with her parents her choice and decision to donate her organs. Jane Hutt, Assembly Member for Vale of Glamorgan said: “I am very proud of my constituents Gaynor, and Colin and Betty, who through their shared experience and commitment to the campaign on organ donation, are keeping the legacy and memory of their children alive. They have been incredibly influential in increasing awareness of the importance of organ donation – and during my time in Government, I remember they were able to persuade people so passionately, with the support of Kidney Wales, to ensure that we moved to change the law to deemed consent. This isn’t a time to sit back however – there is still much to do in order to educate people and the Tell A Loved One campaign continues, in order to help reduce any resistance that is out there”. Llinos Lee, TV Presenter and a family friend of Gaynor Taylor, knew Richard growing up. She said: “Richard and his brother were affectionately known as the naughty Taylor brothers whilst we were young – Richard was always just so full of life and positive energy. I am proud of Wales for the change in law to deemed consent – and I will always be inspired by Gaynor, who even through her grief, at Richard’s funeral – was handing out organ donation register cards. He went on to donate 7 of his organs, helping individuals and their families go on to live full lives. I have a son who is 4, and we go almost every week to the skatepark in the Knap in Barry. He thinks that Richard is a superhero and will grow up believing that organ donation is simply what people do, without question”.